Are reporters at the Miami Herald running out of stories? 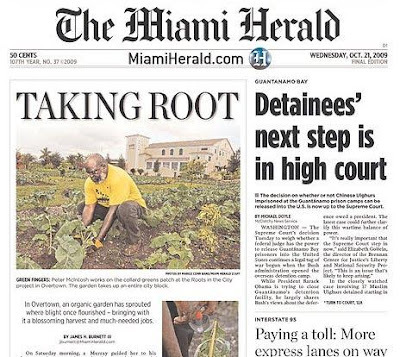 Today the Herald ran a front page piece on urban gardener Marvin Dunn. Bill at Random Pixels says the Herald has covered this story several times already. This is common practice. A new editor who doesn't check past stories, lazy reporters who recycle stories and persistent story subjects who know how to get in the paper time after time. It's amazing how reporters know the recycling bit is going on, yet editors are willing to take the story to fill space. The real solution is for better editors with some imagination who come up with new story ideas, rather than settle for the eighth version of the old lady who tends the cemetary rose garden. No, you have it all wrong! You see, McClatchy was trying to do the right thing, but just mucked it up because of all the layoffs! It all makes sense now. When I watched this video today on Glenn Beck's show, I was most disgusted to see that she was praising Mao from what appeared to be a pulpit of a church; and I wanted to find out where this event took place. Ms. Anita Dunn was the commencement speaker for the 2009 St. Andrews Episcopal School (Potomac, MD) graduating class. From that link, it appears that Ms. Dunn has a child who attends the exclusive school. The graduation ceremony was held June 5, 2009, at the Washington National Cathedral. Both links identify the date and location; the first link shows Ms. Dunn was the commencement speaker. Praising a communist murderer of his own people at Washington National Cathedral. To a bunch of high school kids. From an Obama Administration insider. Lovely. This story about Dunn's feelings for Mao may (or may not) become a liability; so I have saved the webpages to my computer, in case they disappear over the coming days. Will Dunn fit under Obama's bus?